New menu alert: SURA soybean sprout salad! New menu alert! Very pleased to announce our new menu for this season: Soybean sprout salad! It will be available starting tomorrow Thursday June 1, 2017! 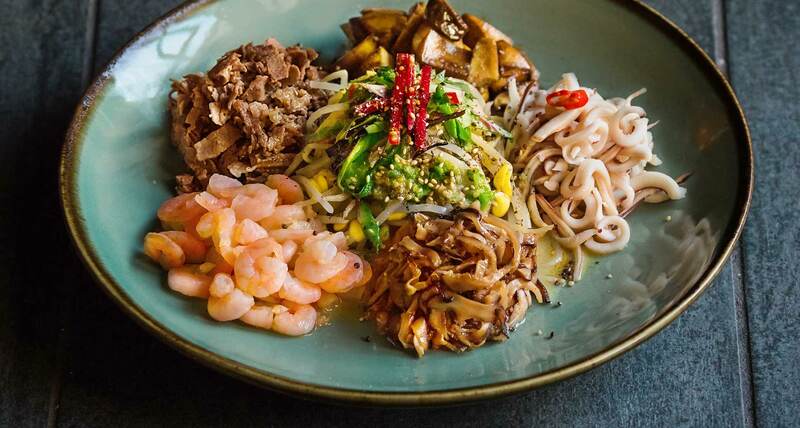 This new entry is an appetizing salad with lightly sautéed baby matsutake mushrooms, shiitake mushrooms, peeled shrimps, pan-fried marinated beef, and steamed soybean sprouts in a zesty soy mustard sauce. In this new dish, there is a joyful attempt to play around with Summer flavour, while still using Korean ingredients to keep to tradition. Nice, fresh, tangy salad which goes well with this glorious Summer season!